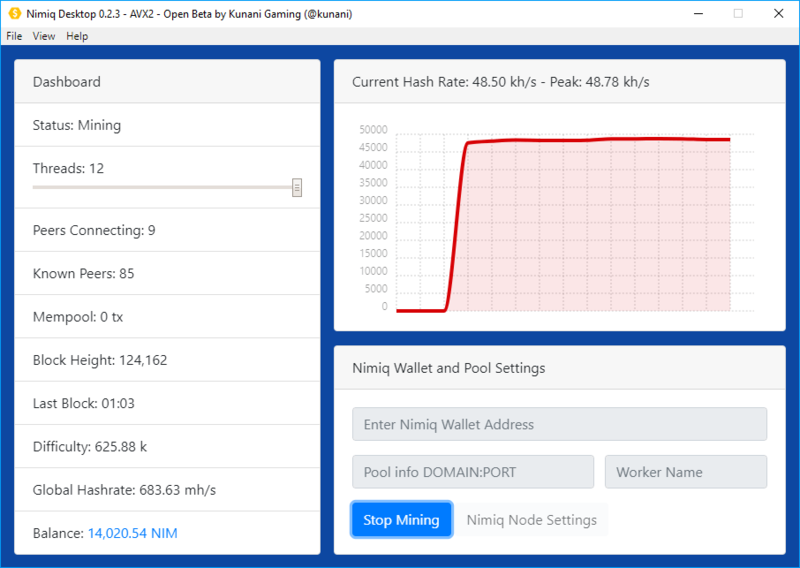 Mine faster with the Nimiq Desktop Miner for Windows 10. The quickest, easiest miner available for mining NIM on Windows. No compiling, no config files. Just install and start mining. Just copy and paste your Nimiq wallet address and preferred mining pool information and press Start Mining. It's that easy. Want to solo mine? You can do that too. Nimiq Desktop is compiled with advanced vector extensions and optimized for Intel / AMD 64 bit CPUS including AVX2 and AVX-512. On start it will find the optimal build and use it. Run a simple dumb miner or support the Nimiq network by running a full backbone node. Accept network connections from other nodes with or without SSL. Version 0.3.4: Updated to Nimiq Core 1.4.1 - Temp fix for Accounts Tree. Version 0.3.2: Updated to Nimiq Core 1.3.1 - Also prep for upcoming experimental features. Version 0.3.1: Applied prune miner fix. Version 0.3.0: Update to current master. Community seed nodes plus various updates and fixes. International language support for Български, 中文, Nederlands, Danske, français, Deutsch, Suomi, Bahasa Indonesia, portugués, Español, Latviešu, Polski, 日本語, 한국어, Русский, svenska, Türkçe. NOTE: Now includes anonymous analytics for app errors, cpu type, peak hashrate, and selected language to help bring even better optimizations. No personal information is ever collected, stored, or transmitted. How do I mine through a pool? Simply enter the mining pool domain and port information. Enter it DOMAIN:PORT format. You can find a list of mining pools from the official Nimiq Community website. Yes, simply leave out the pool information and enter your Nimiq wallet address and press Start Mining. It takes a long time to find a block solo mining so we suggest using a mining pool for faster more consistent payouts. What is the worker name? Every PC you run Nimiq Desktop on must have a unique worker name if you're mining to the same wallet address. Some mining pools use this to identify your PC on their stats page, some do not. What is a backbone node? By default you are mining as a dumb node. You do not accept connections from other nodes. By mining as a backbone node you accept connections from other Nimiq nodes helping to strengthen the network. This is the prefered mode to use when mining. You must make sure the port you choose in 'Host port' is open and forwarding to your PC's internal IP address. How do I setup a full backbone node using SSL? By running a Websockets Secure (HTTPS) backbone you will accept connections from web browser nodes as well as other network nodes. This requires a domain name, dedicated IP address, unlimited bandwidth, and SSL certificates matching your domain name. Note that your mining hashrate will be lower due to the extra processing required by larger number of incoming node connections. First get an SSL cert and private key file for your domain name (example: letsencrypt.org). Rename the cert file to nimiq.crt and your private key file to nimiq.key and copy them to your install directory for Nimiq Desktop /certs folder. Now in Nimiq Node Settings dialog, you will be able to click on Backbone Websockets Secure (HTTPS) and if your certs are available the mode will change from unavailable to Available. Enter your domain name in the host field and incoming host port (default is 8443), and make sure your domain name has a DNS A record pointing to your current external internet IP for your PC. If you don't have a domain name, dedicated IP, and SSL certs don't worry, you can help support the Nimiq network by running a standard Backbone Node (HTTP) above.